The charge by ‘the truffle grower’ that I used a graph “prepared by Global Warming Art” and that I “altered it to fraudulently bolster his case” is an outright, contemptible lie. I have the entire Greenland oxygen isotope data in my computer and use it extensively to plot data, so why would I use anything else? The data I use has never been altered in any way. 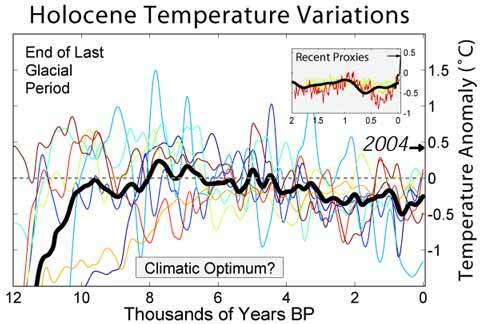 As is obvious, when preparing his 2007 presentation he couldn’t be bothered to get rid of all the temperature proxy “spaghetti” lines from Robert Rohde’s original. 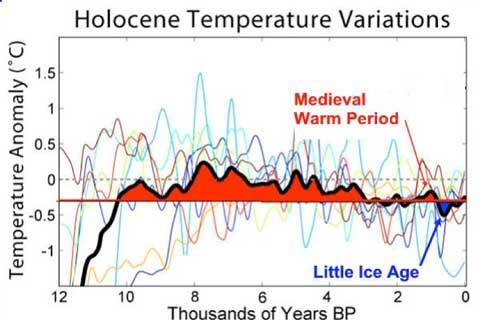 He just took out the inset showing “recent proxies”, drew a new baseline (based, by the look of it on an attempt to replicate the 1905 “present” he prefers to use), and labelled the Medieval Warm Period and the Little Ice Age. The genesis of Easterbrook’s slide at the Heartland conference is clear. He “borrowed” the Global Warming Art graph in 2007 (if not earlier), and made some crude alterations to it then. Over the years, he has refined the presentation somewhat, but compounded the fraud. That he was familiar with GWA as a source of graphical material is also confirmed by his 2007 presentation, because slide 18 is a direct lift of this GWA graph of recent temperature proxy reconstructions, edited by the removal of a data point labelled “2004″. Ring any bells? 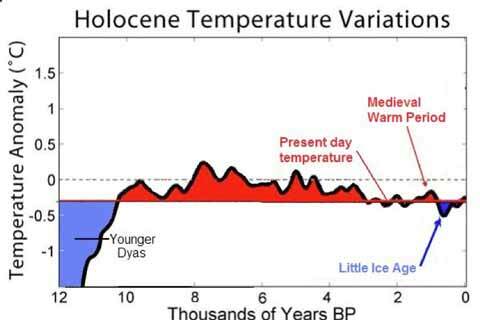 It is quite clear from the evidence that Easterbrook has not only edited these graphics to change the information they contain, but done so in order to minimise the appearance of recent global warming and to support his own oddball contention that global cooling is about to begin. This is at the very least academic malpractice, particularly by such a distinguished professor emeritus. It might be interesting to discover what the Western Washington University thinks of his behaviour. It is also clear that his aggressive, failed attempt to rebut my original post is defamatory, as is the rush to republish his remarks by other web sites. It would be nice if Easterbrook issued a public apology to me and to Global Warming Art, but I will not be holding my breath while waiting for it to arrive. Meanwhile, the silence from the climate sceptic echo chamber about the scandal in their ranks is becoming deafening.